Throughout his career, Valentino Pascucci has been known as power guy at the plate. What was even more special is Val showing off his display of power at the annual Home Run Derby...in Buffalo, NY. "It felt good to be able to participate in the derby at my home field, especially in front of the home fans," Pascucci said. 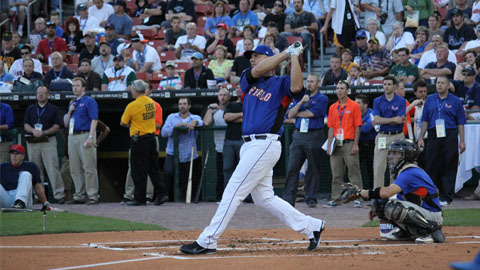 Pascucci brought the home crowd to a roaring applause as he powered past Charlotte Knights outfielder Dan Johnson in the final round to take the Derby trophy at the 25th All-Star Home Run Derby at Coca-Cola Field on Monday night. "It felt like batting practice so it was nothing new to me," Pascucci added. "The crowd was going nuts when I was hitting over the netting in left." Pascucci hit 22 home runs on the night to win the title, but only had three after the first round and needed a tiebreaker to advance. "It was more excitement than nerves on my part," Pascucci added. "The first round is tough trying to get those few mediocre swings out of the way." Luckily, his competitors Dan Johnson and Joey Butler on the IL side of the home-run hitting extravaganza hit three and two home runs respectively. This would put the round into a tiebreaker. Pascucci and Johnson came out victors of the round after Butler failed to hit a home run. Onto the second round, Pascucci cranked up the bat. The big bopper hit 13 home runs to tie up with Dan Johnson, who also had 13 dingers in the second round, to move on to the final round. The crowd went ballistic in support of Pascucci's effort to sneak away with a derby win. At every swing the fans cheered as loud as they could. With the crowd chanting "Val-len-ti-no! !," the power-hitting righty came to the batter's box in the final round. "It was great to hear the home fans chanting my name at every swing," Pascucci added. "It definitely gave me a boost of adrenaline because I didn't want to disappoint them." Dan Johnson led off the round to hit five home runs so all Val needed to do was hit six home runs. Pascucci did just that. With five home runs and six outs on tack, Pascucci clobbered the derby winning home run to deep left to hoist the derby trophy in excitement and provide an electric buzz for the home fans. "It was awesome see (Valentino) Pascucci bash those home runs over the fence," Johnson said. "The guy has a knack for putting good swings in motion to hit the ball out." It was something special for Pascucci to win the Home Run Derby in front of enormous crowd who came out to see the big man do his thing at-bat. It is Valentino's first derby win of his pro career and second time he has appeared in the home run derby, with the first appearance back in 2007 with Albuquerque. "It was definitely reminiscent of the time I had in the derby back in 2007 with the Isotopes," Pascucci added. "Gotta let it fly and treat it like BP; that's what was running through my head at the plate."